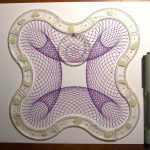 How to know in advance how many points a given wheel will make in any Super Spirograph layout. 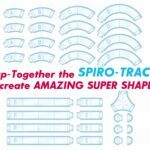 Super Spirograph comes with the same rings and wheels as the regular Spirograph plus the “super” parts shown in the picture, which you snap together to make a big layout. If you want to predict the number of points that a certain wheel will give you in a particular layout, you need to know the number of teeth in the layout. You can then use the table on this page to predict the number of points the design will have. Note that the curves have more teeth on the convex side than the concave side. 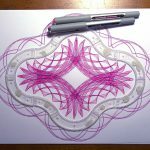 Some layouts have a combination of concave and convex curves on the inside. 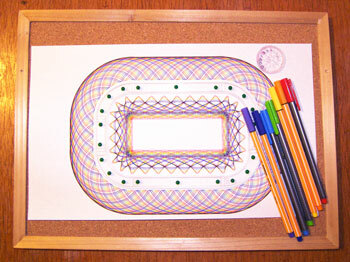 A smaller rectangle allows you to draw designs outside as well as inside on letter-sized paper. This one has one long F piece on each long side, and a short E piece on each short side. 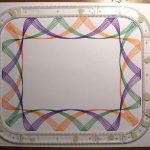 Outside: Note that only the curves are different lengths on the outside. 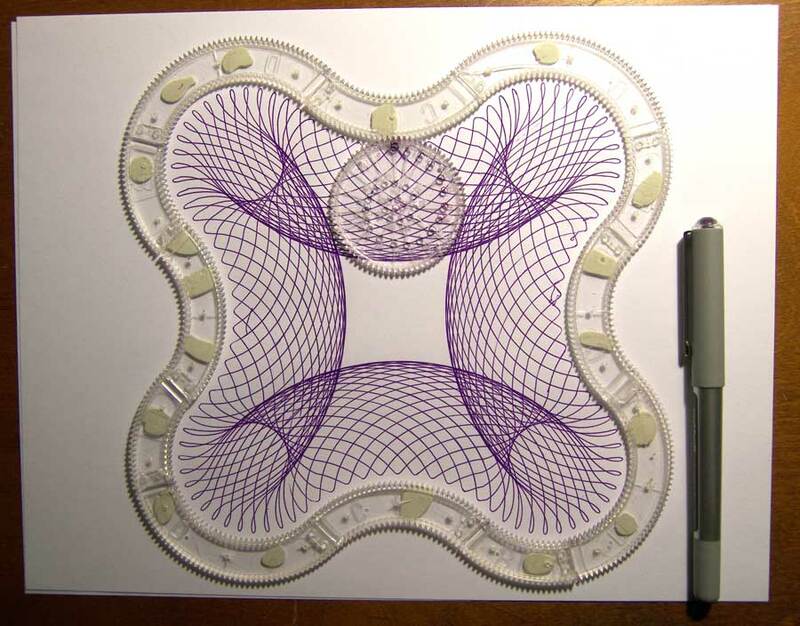 See some Super Spirograph designs drawn with these two rectangles. The cloverleaf is a very curvaceous layout. It is formed from the curved pieces laid out D-B-C-D-B-C-D-B-C-D-B-C, with the C pieces turned in the other direction from the D-B units. To count the number of teeth, use the concave number for D and B, and the convex number for C.
= 4×32 + 4×16 + 4×36 = 336 teeth on the inside. 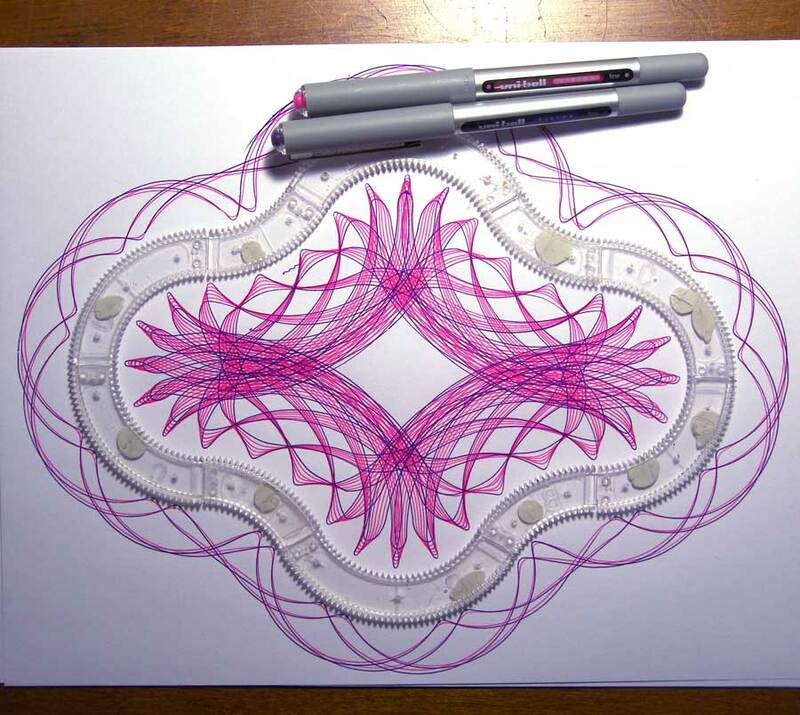 See some Super Spirograph patterns made with the cloverleaf layout. 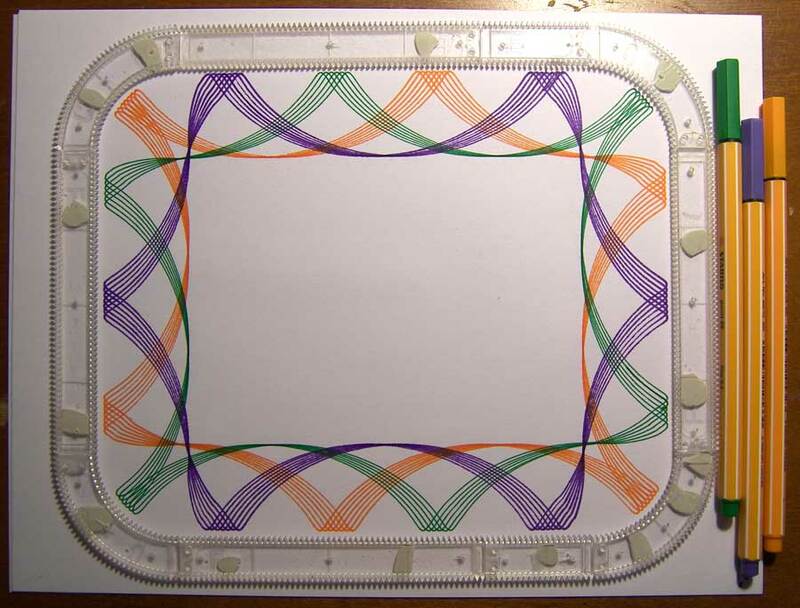 My old Super Spirograph booklet doesn’t even have a name for this layout, it just says “try this”. So I’m calling it the curvy diamond, and I like it a lot. 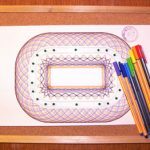 It’s small enough that you can draw designs on the outside on letter-sized paper, as well as on the curvy inside. The east and west wings are two C curves. The north and south wings are a single D curve. The four wings are joined together with B curves faced the other way. Inside: 4 x C (concave) plus 2 x D (concave) plus 4 x B (convex) = 4×24 + 2×32 + 4×24 = 256 teeth on the inside. Outside: 4 x C (convex) plus 2 x D (convex) plus 4 x B (concave) = 4×36 + 2×48 + 4×16 = 144 + 96 + 64 = 304 teeth on the outside. I know the number of teeth. So now what? Now go to the big chart and match your wheel numbers (rows) with your layout numbers (columns) and find the number of points your pattern will have. Under the lid of the old Super box, the curvy diamond pattern is called All Curve, even though they didn’t give it a name in the book. In the new Kahootz Super book, they call the same layout Wide Clover. In the old Super Refill kit, there are 3 “mystery” patterns with this shape. They didn’t name any of the layouts of the mystery patterns and there are some not in the Super book. A Butterfly shape is made with (D(convex)+B+C+F+C+B)x2 with 3 mystery patterns. A Dog Biscuit shape is (C(convex)+A+D+B(convex)+D+A)x2 with 3 mystery patterns. An Alternate Diamond shape is (B+F+D+F)x2 with 4 mystery patterns. Whew!!! By the way, I’m trying to find the mystery pattern page to the 4211 refill kit (the swing marker refill). I have a mostly readable outside envelope of this kit. Love your site—keep up the fun! Thanks for filling in some blanks. The cover of my old super box disappeared decades ago.